Airbus has publicly announced the World Trade Organization (WTO) ruling against the United States over commercial aircraft subsidies for the Boeing Company. However, Boeing does not intend to remain indebted and reminds that it was Airbus who was first accused of receiving illegal subsidies. On 9 June 2017 WTO panel completed compliance proceedings and issued its report on US compliance in the dispute “United States – measures affecting trade in large civil aircraft (second complaint)”, in which the US is found to be non-compliant. The first complaint was ruled in 2012. Airbus applauds the decisionThe decision was welcomed by Boeing’s rival Airbus, especially since the WTO panel found that the B&O tax reductions from Washington State caused Airbus to lose at least US$ 16 billion worth of sales to Boeing. This finding could ultimately lead to the imposition of billions of dollars’ worth of trade sanctions against the US. According to Airbus, the WTO’s Dispute Settlement Body ruled in March 2012 that a number of subsides provided by the US to Boeing were illegal, and were to be withdrawn within six months, or alternatively that their adverse effects were to be removed. In September 2012, the US claimed that it had taken all necessary steps to achieve compliance. However, the EU prevailed in demonstrating the continuing existence of a number of illegal subsidies, including R&D support provided by NASA and the Department of Defense (DoD), and the multi-billion dollar tax breaks from Washington State. The EU has also prevailed in demonstrating continuing adverse effects caused by some of those subsidies. For a further five years, and by failing to comply with the WTO rulings, the US has continued to provide benefits to Boeing in the form of anti-competitive subsidies, resulting in an additional loss of sales of at least 300 aircraft, with an estimated value of US$ 15-20 billion, the WTO claims. In total, combining this with the WTO’s ruling at the end of 2016 in the DS487 dispute, addressing the illegal subsidies for the 777X, as well as prior rulings in DS353, the total impact of the subsidies is estimated to add up to US$ 100 billion in lost sales to Airbus. After the original ruling was published in 2012, the US further increased their subsidies to Boeing, with measures such as the provision of incentives for the production of the 787 in South Carolina, US Federal Aviation Administration funded R&D programs, increased tax reductions from Washington State, and the award of additional NASA and DOD R&D funding and support. These additional measures were included within the scope of the proceedings. Boeing: the pot is calling the kettle?However, in response to the news Boeing argues that it was, in fact, the Airbus that was given an unfair advantage for decades and hurting Boeing’s employees. It argues that similar suit was brought by US against EU and airbus back in 2006 and that recently solved case is a counter-claim, which does not deny Airbus receiving much juicier subsidies by EU. 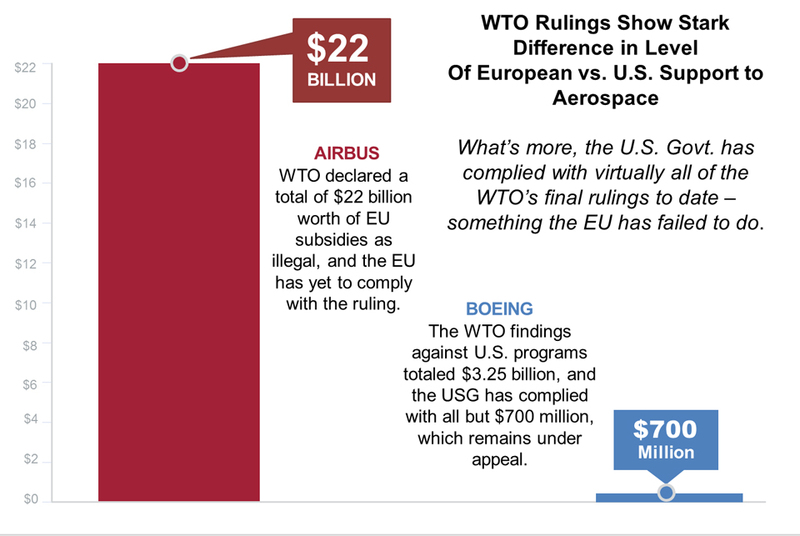 Commenting on the ruling, the company notes that the European Union brought a case against the United State “indirect” subsidies to Boeing of $23 billion as retaliation for the US WTO case against European subsidies to Airbus. It supports US defense against the charges, which noted that the NASA and DoD contracts in question were arms-length commercial transactions where Boeing was paid for research commissioned by the two government agencies. The US government further noted that the NASA research projects were undertaken for public benefit, and that the results and benefits were widely shared, including with Airbus. On the issue of tax breaks, the US government noted that the federal tax break on US exports had already been eliminated, and it noted that the state and local tax breaks that were challenged are common economic development tools consistent with WTO rules. Similarly, the infrastructure projects named in the complaint comply with WTO rules because they are public in nature, and not for Boeing’s exclusive use. Furthermore, Boeing claims it is the EU that “has used delay and stall tactics to continue evading global trade rules by filing their own cases against the United States and ignoring WTO compliance rulings against their illegal practices. They’ve lost badly at every twist and turn, and now it’s time for them to address the $22 billion in illegal subsidies the WTO ruled against them and meet their global trade obligations”. According to Boeing, in 2006, after attempts to negotiate a bilateral agreement, the US government filed a case with the World Trade Organization claiming Airbus had received $22 billion in illegal subsidies. US officials estimated the economic benefit of those subsidies (in 2006 dollars) at more than $200 billion. The biggest and most impactful of the subsidies is known as launch aid – highly subsidized loans to Airbus for the development of new products. Repayment is tied to airplane delivery targets, so typically does not begin until several years after a program is launched. What’s more, the interest rates on the loans are significantly less than commercial lenders would charge, and in the event a product does not hit a pre-determined sales target, remaining loans on the product are forgiven. Launch aid provides significant advantages to Airbus, among them artificially low cost of capital, lower program risk, and the ability to price its products lower than the competition. It also enables Airbus to introduce new products faster than it would be able to do otherwise. The continuation of launch aid and other European subsidies to Airbus poses a significant risk to America’s ability to compete successfully in the global commercial airplane market. In June of 2010 the WTO ruled in favor of the United States on 80% of the total alleged subsidy amounts, and in May of 2011 a WTO appellate panel upheld all of the key findings of the earlier panel. The WTO ruled that Airbus had received $18 billion of illegal subsidies, including $15 billion of launch aid. Airbus-sponsor governments were given until December of 2011 to remove the harmful effects of all illegal subsidies. On September 22, 2016, the WTO confirmed the European governments not only failed to meet the compliance deadline to remedy $17 billion worth of past subsidies provided to Airbus, but that an additional $5 billion in illegal launch aid has since been provided to support the A350. The EU has appealed that ruling, but the US GOVERNMENT expects to be in a position to initiate the WTO process for imposing tariffs on European exports to the United States to mitigate these violations, after the appellate process concludes later this year.